“I find it deeply disturbing that so many members of this Board of Trustees have made the decision not to participate in any way in today’s Board Meeting, and it is equally disturbing that our Chairman, Keith Masser, directly and empathically dissuaded members from attending the meeting today, (a meeting, by the way, that included a very informative and useful session with General Counsel Dunham). 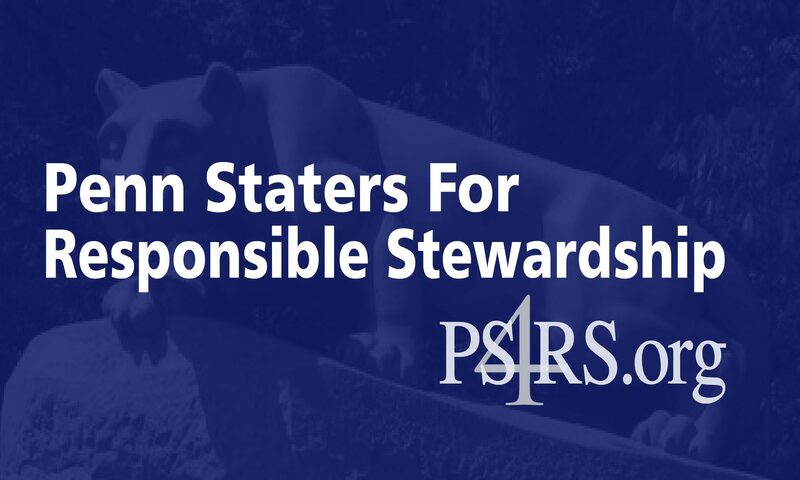 Moreover, in his recent communication, Chairman Masser has suggested that this meeting and our focus on what many believe is the most important fiduciary responsibility in front of this Board, is merely a distraction from more important issues facing Penn State. In his December 10th email to all of us, he says, and I now quote, ‘I continue to be concerned by the single-minded focus and the steady stream of resolutions that have required inordinate amounts of trustee time spent on one issue, and deflected attention from a wide range of vital University issues.’ I’m sorry, Chairman Masser, but I find your argument on this matter to be specious, inaccurate, and insulting to me and many of my colleagues on this Board. I serve dutifully on three committees on our Board: Business and Finance, Academic Affairs and Student Life (as Vice Chair), and the Sub-Committee on Building and Architecture. I was recently one of three trustees that helped in the selection of the Design/Build Partner that we will work with in the complete refurbishment and modernization of our East Halls Dormitory Complex. I have spent considerable time and effort recently with Trustee Abe Harpster and others re-focusing the AA&SL Committee agenda on topics and initiatives that are squarely aimed at the quality of teaching and learning outcomes at Penn State. Up until recently, this Committee was wasting time on many relatively unimportant topics. Now we are beginning to focus on some of the things that will really move the needle at Penn State in terms of both faculty and student’s results and engagement. Things like: tuition levels and the related return on investment on a Penn State degree; measuring student outcomes and employability; time to degree metrics; student engagement and learning opportunities outside the classroom, just to name a few. I was one of a handful of trustees selected to work with our administration on the Middle States Accreditation process for Penn State. I have conducted an extensive and careful review of the draft of our self-study evaluation and report and spoken with Vice Provost Blannie Bowen to discuss the report and give my feedback. I was selected as one of the trustees to serve on the special task force to review and improve Penn State’s Presidential Selection process. In fact, it was my initial recommendation to the Governance Committee that this task force be formed in the first place. I recently met, as an expert advisor, with the leadership of undergraduate and graduate student PSU governing bodies to help them with a new initiative they are working on regarding open source instructional materials and open source content that could be used in curriculum and coursework at Penn State. I served on the Presidential Selection Committee and in the selection process that culminated in the hiring of Dr. Eric Barron. I have been very deeply involved in all of the ongoing Hershey Medical School M&A work, including both Pinnacle Health System and St. Joseph’s Hospital in Reading, as a part of my role as an engaged member of the Committee on Finance and Business. I have visited 10 PSU campus locations during my first year as a trustee—many times of my own volition—including Penn Tech College, Dickinson School of Law, PSU Brandywine, and PSU Greater Allegheny, to name a few. I have presided over four commencement ceremonies at University Park for various Colleges and Undergraduate Groups. I have spoken at a number of Alumni Association events and attended two very successful Penn State Capitol Days in Harrisburg. My engagement level as a Trustee on this Board has been 100 percent. My attendance record at all meetings, interim meetings, planning sessions, and conference calls has been 100 percent as well. I am certainly not going through this list of Board responsibilities and accomplishments to blow my own horn. In fact, many of my Board colleagues here today have comparable lists of their own. We serve because we are proud to serve our alma mater, and we put in the time necessary to do whatever is in the best interest of Penn State. I am going through this list of BoT duties to make an important point. I do not feel the least bit distracted by the work at hand at today’s special meeting, nor do I feel that I am not spending enough time on many other crucial issues that face Penn State. We, the alumni elected trustees, are tired of having people on our own Board attempting to frame our willingness to fight hard against the NCAA and protect our University as a “distraction.” We are tired of being portrayed as people who are single-minded and don’t have the best interest of the University at heart. We are tired of having the Chair of this Board insinuating that we don’t care enough about the nearly 100,000 students that attend Penn State. Disagree with us, if you like, in terms of our position on the NCAA, the Consent Decree, The Freeh Report, etc. But, stop suggesting that we are somehow not doing our jobs as part of the effective governance of Penn State. You would be well served to remember that most of our alumni-base at Penn State believes that it is those of you who disagree with us and chose not to attend today’s meeting who are not participating in effective governance and not fulfilling your fiduciary obligations to Penn State. elected trustees, are pulling more than our fair share of the weight.